People always want to pigeonhole brands. ELAC steadfastly defies such pigeonholing. It was a company that made turntables for the longest time, then it turned to loudspeakers, and now it makes turntables (again) and some excellent audio electronics… as well as loudspeakers. ELAC’s DS-S101-G – from its currently one-product strong Discovery Series – might not have the most trip-off-the-tongue name in audio, but it’s one of those very clever products that does more than you ever thought you need, but ends up showing that you need more than you ever thought possible. ELAC gives the Discovery the tag line, ”Discover the world of computer audio without the computer” and that’s probably about as accurate as it gets. Well, sort of. In fact, a more honest depiction of Discovery would be “Discover the world of computer audio with a small, dedicated computer in a domestically-friendly box”, but it doesn’t trip off the tongue as easily. You see, the DS-S101-G has a 1.2GHz Quad Core ARM A9 processor, with its own operating system running on 512MB of memory, and a further 8GB of flash memory acting as storage for metadata. That doesn’t make it the kind of computer you could use to send email or compose your next symphony while watching YouTube videos of cats, but it does make it about as powerful as a typical smartphone or tablet. Put another way, the computing power inside the Discovery DS-S101-G is about a couple of hundred million times greater than NASA had during the Apollo 11 mission! This is coupled to a pair of on-board Cirrus Logic CS4398 DACs for internal digital conversion. Discovery is basically a Roon-friendly digital hub, taking streaming and networked audio (from the Ethernet, and if you want from a local USB drive, as well as Apple AirPlay) and converting them into good old analogue audio and digital datastreams that traditional audio systems can access (Toslink, coaxial, and stereo RCA connectors). It comes with a Roon Essentials license as a backbone, which means a free Essentials app controls your music without relying on the full-strength Roon license. Set up is ludicrously easy as a result. Plug the Discovery into your Ethernet (wired only, and it needs to be the same Ethernet connection that is used by your Network Attached Storage, and the tablet or smartphone that is running Essentials, natch). Download and fire up the Roon Essentials Control app, maybe enter your TIDAL password (if applicable, and in this context you would be seriously hobbling the system if it isn’t applicable) and let it rummage through your NAS box’s contents for a while, and it’s done. Plug the Discovery into your existing hi-fi system and you just jumped into the here and now. That’s only the start. Add more Discovery devices around the home, and you have additional groups or zones. Add in other AirPlay or Roon Endpoints and you have extra zones too. You can even run a second Roon Server/Core system simultaneously now (thanks to the latest 1.3 firmware update), as Roon and Roon Essentials can operate at same time. In addition Discovery ‘1.3’ can also receive streams directly from Roon. Roon Essentials limits you to knowing your way around 30,000 tracks, which is a lot but includes both your local and TIDAL content. If you have more than 30,000 tracks in your collection, you either need to start pruning, or chose another box. ELAC touted a Discovery Q device at this year’s CES that works with the full-thickness version of Roon, but that has not materialised as yet. ELAC’s Discovery DS-S101-G is defined not only what it is, but what it isn’t. It isn’t Bluetooth compatible. It isn’t a DLNA or UPnP compatible network device, AirPlay aside, it doesn’t have any kind of Wi-Fi connectivity, or full internet radio access, or even digital audio inputs. And, if you have already explored MQA on TIDAL and add those tracks to your playlist, you won’t be listening to MQA. It’s quasi-academic on local or internet network streaming, but DSD is not included, either. Ultimately, the Discovery DS-S101-G is just a black box (well, black and silvery-pink box, with a nice little white LED on the front panel), designed to do one thing and one thing well. That one thing is to make you enjoy your music. Setting aside the sound quality for a moment, ELAC Discovery’s intrinsic link to Roon Essentials imposes some limits on the system because you must have a relatively recent iDevice or Android device, and because of its wired-only Ethernet system, this might pose problems for those only relying on a home WiFi network. Yet, these seem more like objections than obstacles. There is a Sonos-shaped elephant in the audio room. 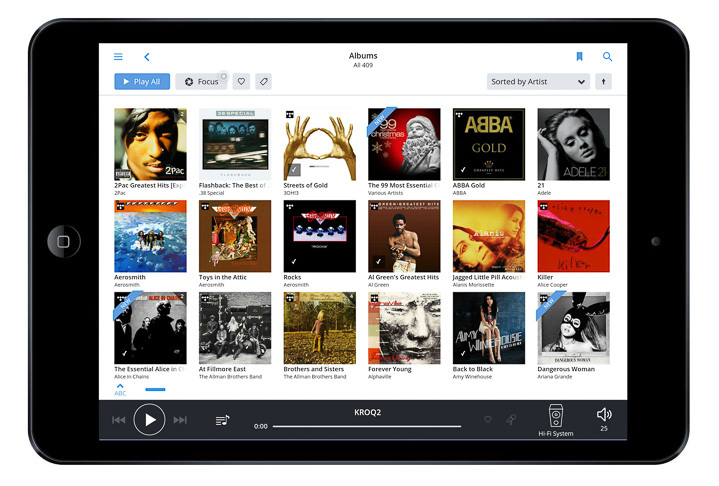 Sonos sets a standard for ridiculously easy interaction with the musical world. You need to be a special ‘actively-stupid’ class of person to be incapable of making Sonos happen at home. Unfortunately, all that ease of set-up and use doesn’t make up for the mediocre sound of the Sonos system, which is all the more noticeable when hooked to a system proper instead of a battery powered loudspeaker. In most cases, the audiophile solution takes the complete opposite approach; excellent sound, but an overly complex set-up and often dense operation. The ELAC Discovery is the rare exception that brings a sense of much-needed balance to the proceedings. ELAC’s offering has an ease of installation that even takes on Sonos at its own game, and yet has the kind of sound quality that works well for audiophiles.